It's possible that your organization is small enough that you're only working on a single project. But more likely, you've got more than one iron in the fire. On a typical software team, you'll set up a project for each individual product that you have under development. This lets you sort cases so that the developers, testers, and managers working on a particular product only have to deal with the cases that concern them. ■Tip Don't make the mistake of thinking that projects absolutely must map directly to products. If your requirements are unusual, it may make more sense to brainstorm an alternative arrangement. For example, if your primary business is customizing an off-the-shelf product for a vertical market, and you assign customization to representatives around the country, you may want to set up one project for each geographical region. If you're an administrator, you can see a list of projects that are already in the system by clicking the Projects link on the Administrative Tools bar. This will open the list shown in Figure 3-4. ■Note You'll see in Figure 3-4 that one of the projects has a note Indicating that it's an Inbox. Only e-mail-enabled projects will have such a note, and you can't edit these notes yourself through the FogBugz user interface. See Chapter 5 for more information on e-mail enabling a FogBugz project. • Edit a project by clicking the edit icon or the project name. • Delete a project by clicking the delete icon. • View details on the associated client or department by clicking the client or department name (you'll learn more about clients and departments later in this chapter in the section "Setting Up Clients and Departments"). • View details about the project's primary contact by clicking the primary contact's name. • Create a new project by clicking the icon or text at the bottom of the list. 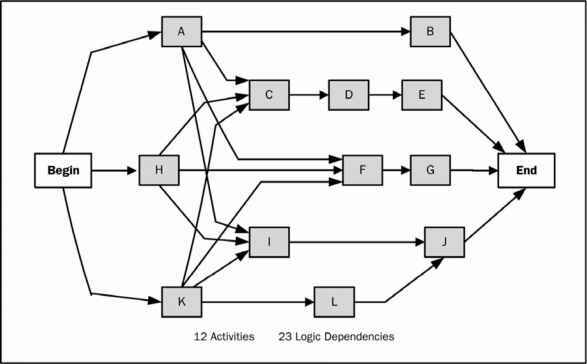 When you choose to create a new project, FogBugz presents you with the screen shown in Figure 3-5. To get started, you need to choose a name for the new project. Ordinarily, this should be the name of the product, though you can use any arbitrary string of characters up to 128 characters in length. cases to this project from a restricted interface, choose 'Yes'. ■Tip Don't include the release number in the project name; you'll set up releases for that. By including multiple releases of the same product in one project, instead of creating a project for each release, you'll make it easier to move cases from one release to another. 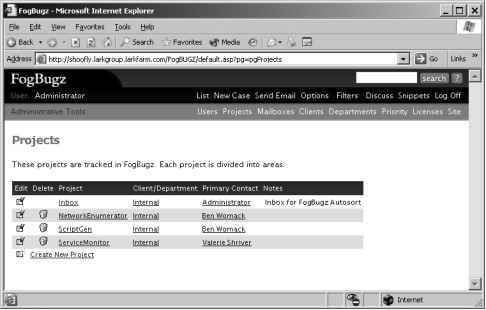 You also need to select a FogBugz user to be the primary contact for the new project. The primary contact is the person whom you've designated to look at cases and assign them to the appropriate person to fix. When someone enters a new case, they usually leave it assigned to the primary contact, the default. The primary contact will get e-mail as soon as the case is saved for the first time, so they'll know to look at the case and assign it to the proper person on their team. ■Tip If you are working on a large project team, you may want to have several people who help categorize new cases. To do this, you can (assuming you have enough licenses) set up a virtual user account called "Up For Grabs" and make Up For Grabs the owner of the project. You can use as many e-mail addresses as you want for Up For Grabs, separated by commas, so that a group of people receives an e-mail notification whenever there's a new bug in a particular project. Anyone who wants to help sort through new bugs can create a saved filter on "all cases assigned to Up For Grabs," which they check occasionally. Finally, you can choose whether to allow public submissions to the project. If you do allow public submissions, and your FogBugz server is at a URL that is publicly available, then it's possible to submit cases to the project without being logged in to FogBugz. In most cases, I'd suggest you use the e-mail features of FogBugz to allow anonymous cases and keep your FogBugz server off the Internet instead of allowing direct public submissions, for a little bit of extra security. Clicking OK on this screen will create the new project and return you to the list of projects. The next step is to click the project name so that you can create areas and releases for the project. Figure 3-6 shows the project editing screen for a brand new project. & ® Misc IEr Create New Area Each project is divided into functional areas. You must have at least one area per project.